Today I have the pleasure of introducing you to Maria Jürimäe. She is one of the leaders of our Silk Artist's Team on Etsy. It has been a pleasure getting to know her a bit over the past year or so and you are in for a treat with her story today. 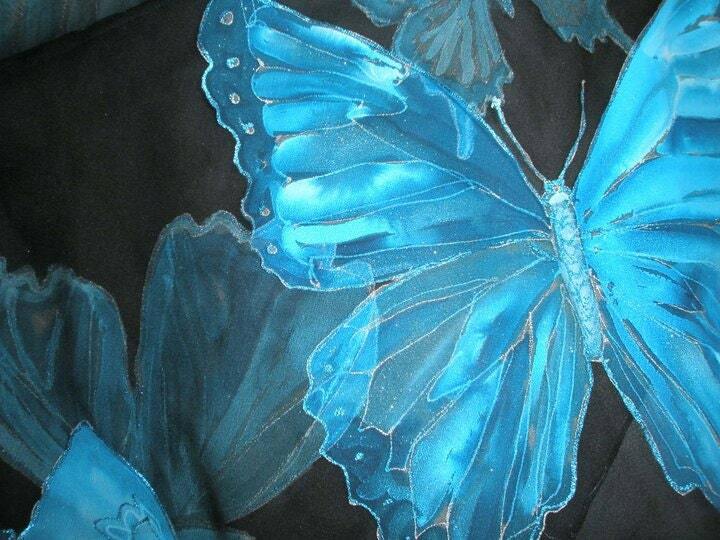 I am an Estonian silk artist, I have painted on silk and taught silk painting for over 16 years. I am member of SPIN and one of the leaders of Silk Artists Team in Etsy. I also work at the University of Tartu in the field of education. I have two lovely daughters, 6 and 8 years old and sometimes they participate in my silk painting or develop their own creations. I have painted with watercolors as long as I remember myself - my father is an artist, so painting was just a natural part of living. Watercolor didn't have a bad smell (like oil paints had) and the transparency and blends were enchanting. I also loved the thinking part - you had to plan your work in advance to get the dreamed result. I discovered silk painting as a student and fell in love with it immediately - compared to watercolor it allowed even better blends, the color of steam fixed dyes was just irresistible! And silk had a distinct character – it was a living material and in the beginning it seemed to me that I have just two options – to let silk to whatever she wants (and just admire it and help the process by adding some dyes, water, salt, etc.) or to try to do what I want and end up with disappointment. Learning to accept silk and cooperate with it was really a rewarding experience. And eventually I have learned to think “the silky way” and am able to express even the most complex ideas on silk – not forcing my will over it, but with cooperation this wonderful material. The nature, the God, the Angels, the music. . . I love to be the medium. Most of my scarves just “come to me” from somewhere – I just have to let the brush to do its work, and sing my songs. It is a wonderful feeling. What is your favorite silk painting you have painted? It is almost impossible to pick one favorite. 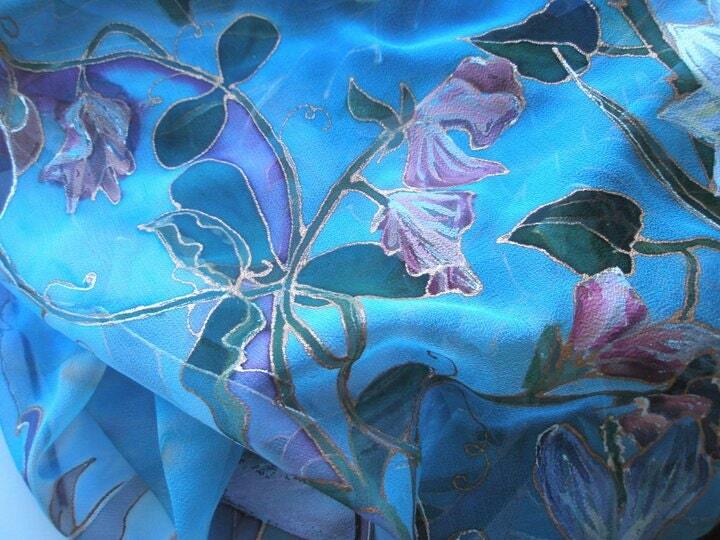 But because it is spring I will choose one of my signature scarves: Lily of the Valley. I love silk dyes fixed by steam. I have mixed the dyes by myself and used Pebeo, Marabu, Schjering. I just love those bright colors! Nothing can be compared to steam fixed silk dyes. My favourite guttas are from Marabu – they work well and don’t add extra texture to silk. I love the softness and tender touch of silk. This material is perfect for feeling. . . so my favourite types of silk are crepe satin and ponge. I hesitated a long time before opening an Internet shop – because photos are just 2D images of my soft, shiny, living scarves. . . but it seems that the magic of silk can be somehow captured even via photos. 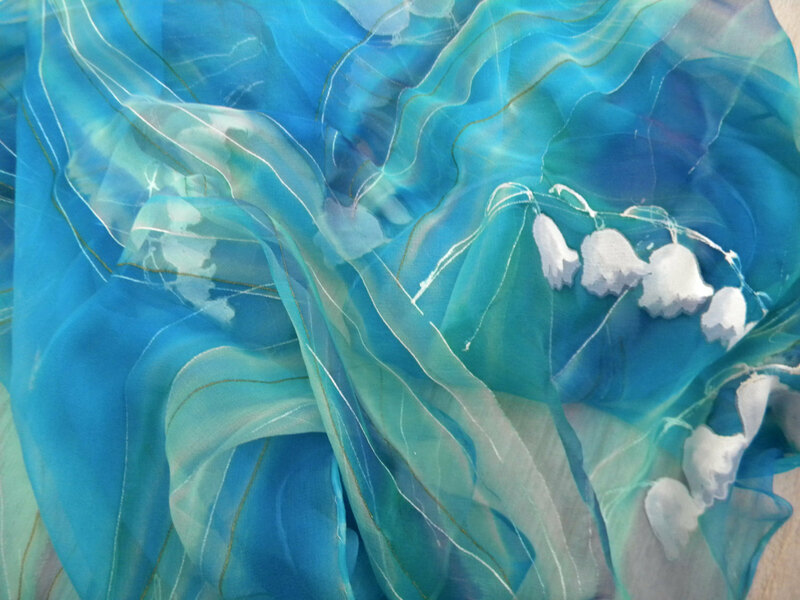 I have also loved to learn very thin and transparent chiffon silk – it is hard to paint because it is so transparent, but it gives a really rich and elegant result especially in evening wear. I order most of my scarves, dyes, and guttas from Estonian resellers Vunder and Scanimpex. If I have to pick up one tip, it might be – cooperation with silk. I almost never pre-plan my silks in detail by drawing a 1:1 size paper with the design. I begin to play with colors on silk and adjust my design ideas according to results. This way every scarf or tie will be one-of-the kind (I have painted for over 1000 scarves) and the energy of scarf will be free-flowing, not forced. If something goes “wrong” it actually is a sign to continue the work in (a bit) different direction – learning to read those signs takes some time, but it is surely worth of learning. OK, this is more philosophy as tip. So something more practical too: to avoid the back-flow from pre-hemmed edges I suggest firstly to paint the right side of silk with quite dry brush (especially the edges – when the brush is wet the silk absorbs it and later it results with back-flow) and when the silk is ready, to add just very little paint with large, but dry brush to those areas of back side that have remained white. Lovely! I really admire all your creations on etsy, and I must say you thoughts about cooperating with silk are very inspiring! Thank you for sharing!